As we’ve noted before, saints portrayed in Christian art often carry objects that help identify them in art. While some saints carry relatively benign, pedestrian objects — Saint Anthony often carries a white lily, Saint Notburga an ear of corn — others tote more lethal implements including an assortment of knives, swords, arrows, and wooden stakes. Martyrs in particular are frequently shown with deadly devices, generally the instruments of their martyrdom. A curious subset of martyrs, however, are commonly shown carrying their own heads. Known as cephalophores, literally “head-carriers” in Greek, these headless saints all suffered martyrdom by decapitation. Although depicting cephalophores may at first seem straightforward, artists have struggled for centuries with an unusual problem presented by their portrayal: Where does one place the halo on a headless saint? John Quidor, The Headless Horseman Pursuing Ichabod Crane, oil on canvas (1858), National Gallery of Art, Washington, D.C. Stories of headless men and their improbable feats are not confined to the Roman Martyrology. Secular examples include Washington Irving’s The Legend of Sleepy Hollow and the 14th-century Arthurian legend Sir Gawain and the Green Knight, which features a remarkable contest known as a “beheading game.” In the story of Gawain, a giant stranger known as the Green Knight appears before King Arthur’s court on New Year’s Day. The Green Knight challenges the members of the court to strike him with his ax on the condition that he will return the blow in one year and a day. Gawain accepts the challenge, and the Green Knight prepares to receive Gawain’s strike by brushing aside his long locks and laying bare his neck. Gawain then grips the ax, raises it into the air, and lets it fall. The author of the legend tells us, “The sharp edge of the blade sundered the bones, smote through the neck, and clave it in two, so that the edge of the steel bit on the ground, and the fair head fell to the earth . . . .” The Green Knight, however, “neither faltered nor fell,” but instead, with his hand out-stretched, caught the head, lifted it up, and mounted his steed “as if naught ailed him, and he were not headless.” Then the “grim corpse,” bleeding freely, held up the severed head and turned its face toward the gathered knights. Its eyelids lifted open, and the head spoke, warning Sir Gawain to keep his promise. Like the Green Knight and the Headless Horseman, whose severed head rested on the horseman’s saddle before he hurled it, dodgeball-like, at the hapless Ichabod Crane, the bodies of cephalophores remained animated even after the detachment of their heads. They even performed with a remarkable degree of agency, often selecting the sites of their own burials. Saint Denis, Basilique Sacré-Coeur, Paris, France. The Basilique Sacré-Coeur (Basilica of the Sacred Heart), located in Montmartre, is traditionally associated with Saint Denis’s beheading. In The Golden Legend’s account of the death of Saint Denis, the saint collected his severed head and walked an appreciable distance with it after his beheading. According to the story, after Saint Denis, also known as Saint Dionysius, had been beheaded by a sword, his body “[i]nstantly . . . stood up, took his head in its arms, and, with an angel and a heavenly light leading the way, marched two miles, from the place called Montmartre, the hill of martyrs, to the place where, by his own choice and by God’s providence, he rests in peace.” The abbey church of Saint-Denis was later erected on the spot where Saint Denis was buried. One of the Fourteen Holy Helpers, Saint Denis is often invoked for relief from headaches. Another cephalophore, Saint Aphrodisius (or Saint Aphrodise) of Béziers, similarly retrieved and traveled with his severed head before settling on a final resting place. Saint Aphrodisius, the first Bishop of Béziers, was decapitated on the site of the Roman circus at Béziers, and his head was unceremoniously tossed into a well. Miraculously, the saint’s head was ejected from the well and rolled back to saint’s body. The headless corpse then picked up the head and walked with it through the city to the site of the hermit cave where the saint had lived during his lifetime. The Basilica of Saint Aphrodisius of Béziers (Basilique Saint-Aphrodise de Béziers) was later erected on the spot where Saint Aphrodisius was buried. Joos van Cleve, Saints George and Nicasius with donors (detail of Saint Nicasius), oil on panel (c. 1515), Alte Pinakothek, Munich, Germany. Here, Saint Nicasius is depicted with just the top of his head missing. Saint Nicasius of Rheims, is commonly portrayed with either his entire head or just a portion of head missing. According to Butler’s Lives of the Saints, Saint Nicasius was a 5th-century Bishop of Rheims who was killed by a marauding army of Gauls. Standing in the doorway of his church, Saint Nicasius was massacred with his deacon, Saint Florentius, and his lector, Saint Jucundus, by his side. The Gauls apparently cut his head off, although, as noted, he is often shown missing just the top of his head. Other cephalophores frequently represented with their severed heads include Saint Just, Saint Ginés de la Jara, Saint Firmin, Saint Minias, the siblings Saints Felix and Regula, Saint Exuperantius, Saint Valerie, Saints Maxien, Lucien, and Julian, Saint Chéron, and Saint Osyth. Although Saint Paul of Tarsus was martyred by beheading, he is more frequently depicted with a book of letters, signifying the letters he wrote to the earliest Christian communities, or a sword, the instrument of his martyrdom. The Golden Legend notes that at his execution, “[a]s soon as his head bounded from his body, it intoned, in Hebrew and in a clear voice, ‘Jesus Christ.’” Meanwhile, although not a cephalophore, Saint Cuthbert of Lindisfarne can easily be mistaken for one. Saint Cuthbert commonly carries a severed head, although it is not his own. It belongs to Saint Oswald, whose head was buried with Saint Cuthbert at Durham Cathedral. Whatever the origin of the trope, artists entrusted to render the personalities of cephalophoric saints faced an uncommon challenge. Saints in art were generally depicted with a halo or nimbus behind their heads, indicating their great dignity and sanctity. While many artists continued to follow this convention for cephalophores, the unusual placement of a cephalophore’s head, which artists often deposited in the headless saint’s hands, could visually diminish the effect of the golden, glowing halo. Consequently, artists sometimes sought other ways to communicate the sanctity of cephalophores. Saint Nicasius, Rouen Cathedral, Rouen, France. Saint Nicasius is holding his bishop’s mitre and is missing the top of his head. One approach involved placing the cephalophore’s halo around the saint’s neck, where the head had been. Saint Denis is depicted this way on the Cathedral of Notre Dame in Paris, as is Saint Nicasius above the north portal of Rheims Cathedral. Another approach involved rendering a cephalophore with two halos: one above the saint’s decollated head and one around the saint’s neck, which was sometimes shown spurting blood. Saint Denis is depicted this way in a manuscript illuminated by the Master of Sir John Fastolf and on the coat of arms of the city of Krefeld, Germany. Léon Bonnat’s famous Le martyre de Saint-Denis at the Pantheon in Paris depicts a variation of the double halo concept. 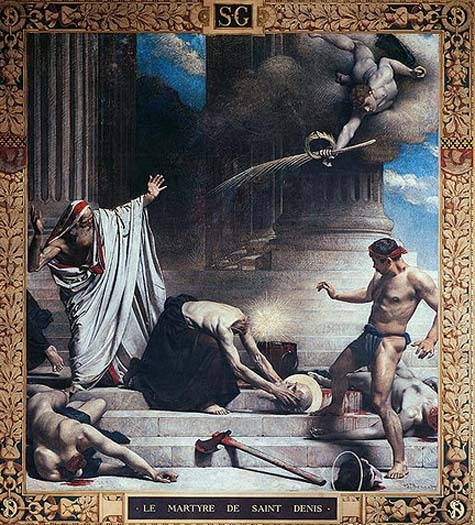 In Bonnat’s painting, the headless bodies of Saint Denis’s companions, Saints Eleutherius and Rusticus, are strewn to Saint Denis’s left and right while a bloody ax rests on steps in the foreground. To the upper right of the painting, an angel swoops from the sky bearing a palm frond and crown of martyrdom. Meanwhile, at the center of the painting, Saint Denis’s headless body is shown scooping up its head like a fumbled football. The disembodied head is surrounded by a distinct halo, but the space above Saint Denis’s neck, where his head would have been, is also aglow. Not quite a halo, nimbus, aureole, or other traditional marker of saintliness, the glow appears as a riot of sparks reminiscent of a holiday sparkler. The Martrydrom of Saint Nicasius, stained glass (early 13th century), Basilique Cathédrale Saint-Gervais-et-Saint-Protais de Soissons, Soisson, France. Courtesy Wikimedia Commons. 1 Sir Gawain and the Green Knight: A Middle-English Arthurian Romance Retold in Modern Prose 15-16 (Jessie Laidlay Weston trans., 1900). Jacobus de Voragine, 2 The Golden Legend: Readings on the Saints 240 (William Granger Ryan trans., 1993). 4 Butler’s Lives of the Saints 67-68 (Herbert J. Thurston, S.J. & Donald Attwater eds., 2d ed. 1956). Butler’s Lives of the Saints explains that the cultus of Saint Dionysius or Saint Denis was very strong in the Middle Ages and that by the 6th century he was already recognized as “the saint of Paris par excellence.” Id. at 68. See, e.g., Scott B. Montgomery, Securing the Sacred Head: Cephalophory and Relic Claims, in Disembodied Heads in Medieval and Early Modern Culture 92-93 (Catrien Santing et. al, eds., 2013). Jacobus de Voragine, 1 The Golden Legend: Readings on the Saints 353-54 (William Granger Ryan trans., 1993). Montgomery, supra note 6, at 85. George Ferguson, Signs and Symbols in Christian Art 149 (1954). Montgomery, supra note 6, at 86.